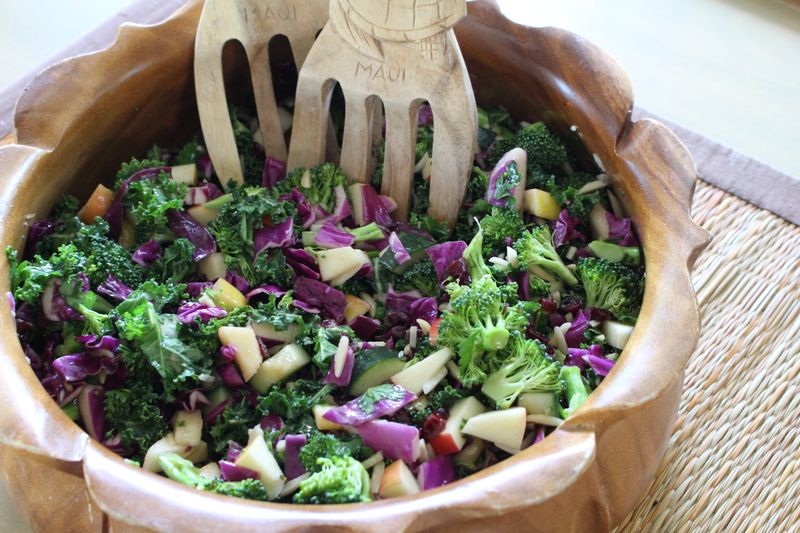 This salad is so light and tasty- it is an “any crowd” pleaser. It works great for potlucks or Sunday BBQ’s. The dressing has a sweet tangy taste with a hint of sesame. It is vegetarian, paleo, and full of super foods that make your body happy! Enjoy! Start by preparing the salad first. 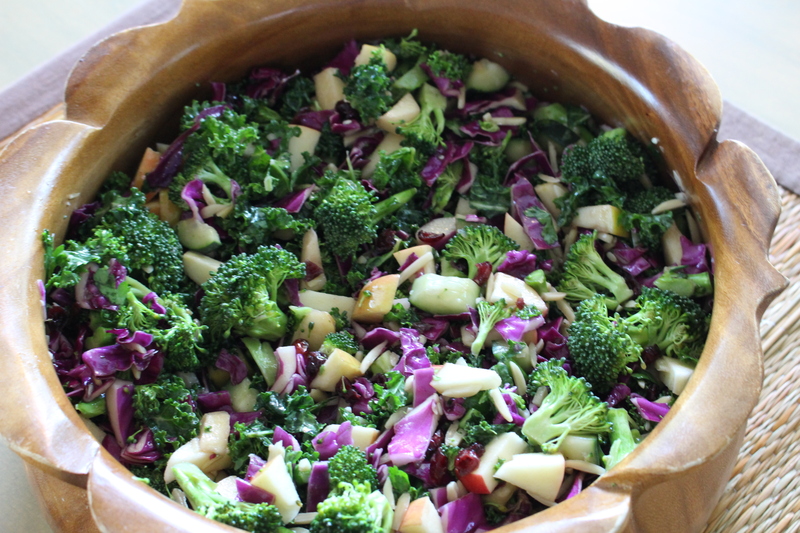 Wash all the veggies and find a large serving bowl. Rip apart the kale, discard the stems, and massage for about 30 seconds. Chop up the remaining vegetables and apple into bite sized pieces (discard the broccoli and parsley stems) and add to the bowl. Mix the salad together adding in the slivered almonds and dried cranberries. Next prepare the dressing. In a large measuring cup add the balsamic, the honey, and the avocado oil. Whisk together to blend and breakdown the honey. Once it has mixed together whisk in the sesame seed oil, salt, and black pepper. Pour the dressing over the salad and mix together to incorporate. Since these are hearty vegetables the ingredients won’t wilt if the dressing sits on too long. 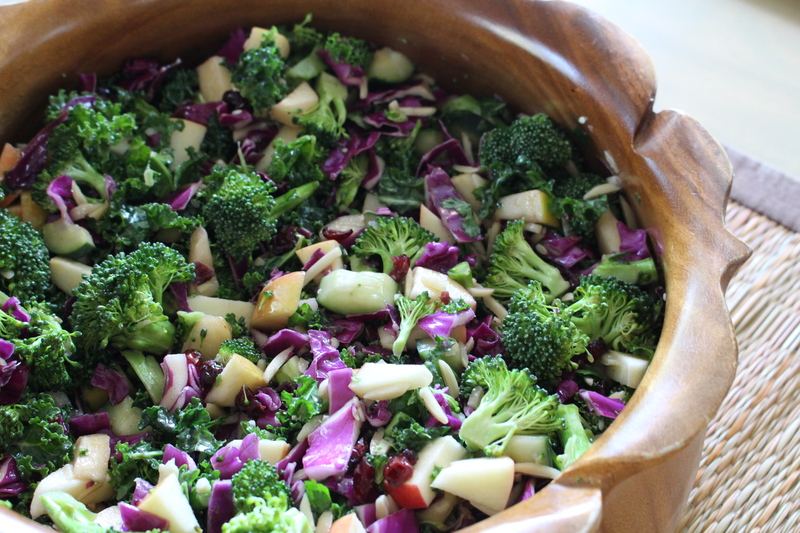 In fact I would suggest letting the dressing sit on the salad for at least an hour before the event/meal as it seems to soften up the broccoli and kale making it easier to chew this raw salad. You could easily turn this into a complete meal by adding in some grilled chicken or more nuts and seeds. Makes 12-15 side servings or 6 large servings.